Hyperinsight – is Master Reseller for Coveo Solutions Inc in Australia & New Zealand – plus coverage for China, India, Middle East and most of Asia-Pacific. is Master Reseller for Coveo Solutions Inc in Australia & New Zealand – plus coverage for China, India, Middle East and most of Asia-Pacific. Hyperinsight specialises in helping an organisation’s staff, customers and other stakeholders instantly and securely locate all the authorised information they need each day in order to make the best choices and decisions. Coveo’s solutions adhere to both the security and the business rules of an organisation and to the privacy of its staff. We are a team of fully accredited enterprise search experts who professionally advise our many customers on how to use search-powered solutions to improve access to their organisation’s information in order to enhance business operations and enrich the lives of stakeholders. We build value by using Coveo Search to help drive overall organisational effectiveness – based on a principle long-recognised by the Gartner Group, viz. However, most knowledge workers are often starved of the critical information they need to work better and smarter …and therefore. For more details about our enterprise search solutions feel free to explore and learn about the products and services we offer on this site, or simply Contact Us to discuss your business requirements. Coveo Enterprise solutions are underpinned by the best of breed software – the Coveo Enterprise Search platform – delivering instant access to information stored in almost repository no matter where located or managed – inside the corporation, in the cloud or on the internet. 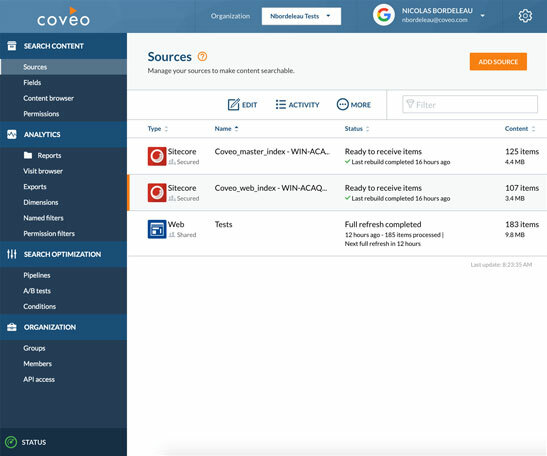 Coveo Enterprise Search 7.0 takes corporate search to the next level – faster processing, less hardware, business-oriented interfaces so you can easily track valuable information assets and intuitively gain insight.